The poet John Keats is so often quoted at this time of year, the words from his lyrical poem To Autumn speaking across two centuries of this “season of mists and mellow fruitfulness”. 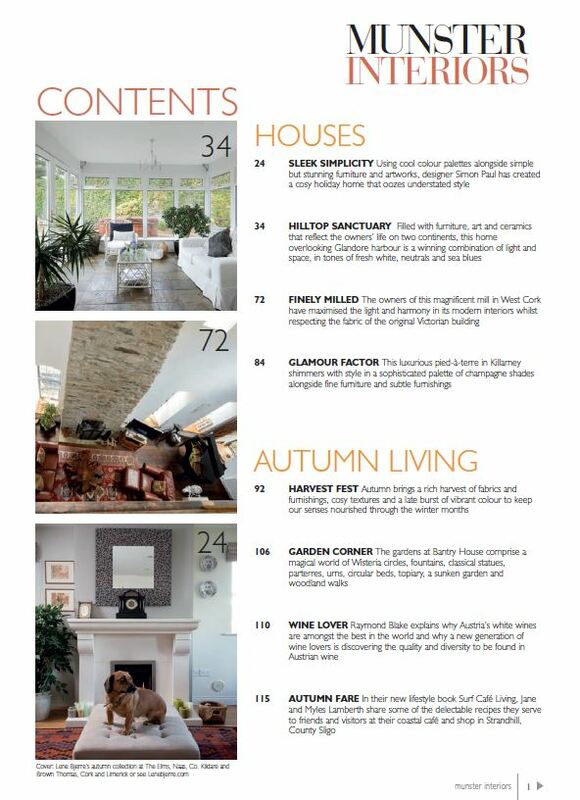 We’ve tried to capture that mellow feeling in this issue in our Harvest Fest and Rustic Chic features with a celebration of organic tones and textures. We also look at a range of kitchens where natural wood is resurfacing as a popular option and find this a recurring theme when it comes to selecting dining furniture too. Independent heating consultant Seamus Brennan shares his advice for selecting solid fuel stoves whilst Robert Gill talks about smart energy management solutions. In the first of our house shoots, we meet interior designer Simon Paul at a holiday home in West Cork where he’s used cool colour palettes alongside simple but stunning furniture and artworks to create a haven of laid-back style. We also visit a coolly elegant home overlooking Glandore harbour, a majestic restored Mill, and a shimmering pied-à-terre in Killarney. We talk to artist Blawnin Clancy who is endlessly inspired by the coastline of the Ring peninsula whilst wine writer Raymond Blake explains how Austrian wines are benefitting from Austria’s forward-looking wine industry – he recommends a weekend visit to Vienna to sample the wines and the city! We also get a preview of Surf Café Living by Jane and Myles Lamberth who share some of the delectable recipes they serve to friends and visitors at their coastal café and shop in Strandhill, County Sligo. Congratulations to Grace Reidy in Montenotte, Cork who won the competition in our last issue for a break at the Dingle Skellig Hotel. 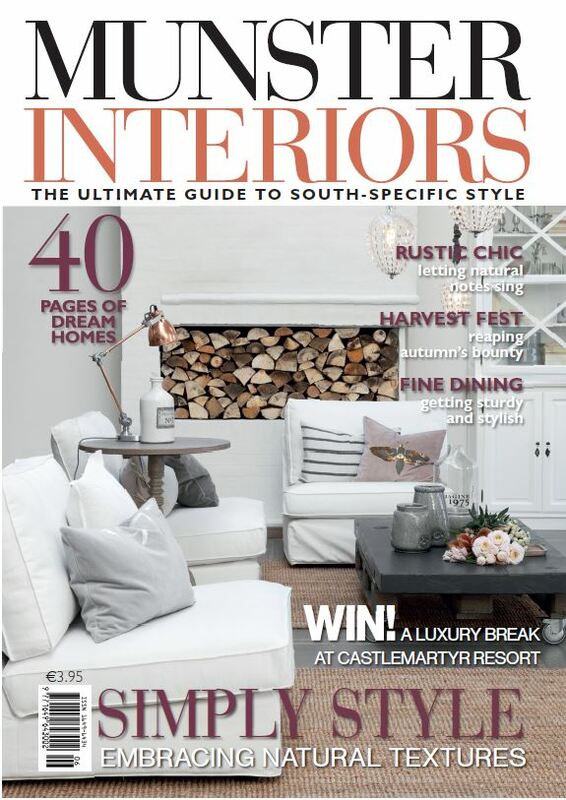 In this issue, we’re offering a luxury break for two at the Castlemartyr Resort nestled in picturesque woodlands in East Cork. Hope you’re enjoying a hot cuppa and settling down to enjoy the read – see you soon! 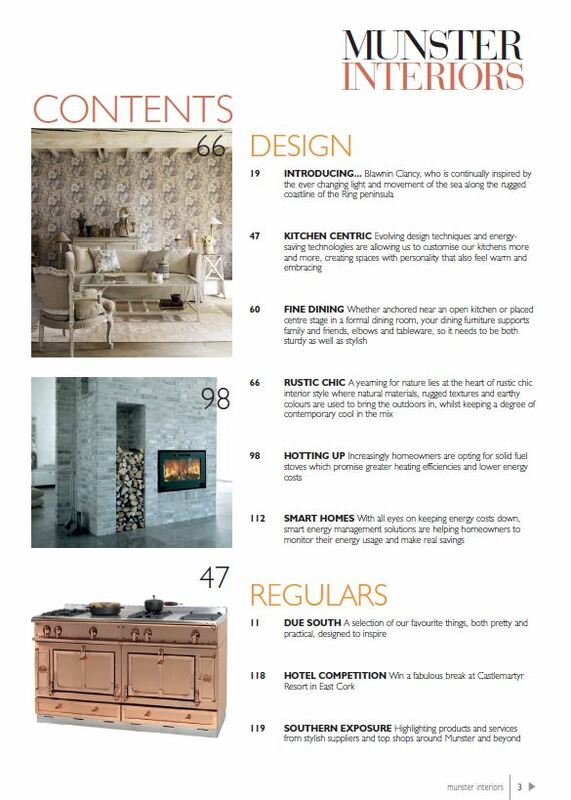 Tags: Autumn 2014, Munster Interiors Magazine. Bookmark the permalink.